Keith is a bi-vocational student pastor, writer, teacher, and speaker. He has been in student ministry at City View since 2008. He holds a B.A. in History from King College and a M.A. in Education from Tusculum College. Keith is a writer and writes bible studies for the YLO Interlinc program that gives youth pastors bible studies to Christian music. Keith also speaks at various youth events and disciple-now events across the country. 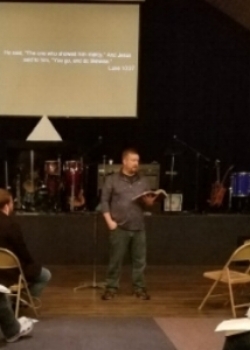 During the week, Keith is a history teacher at Jefferson County High School and is currently working on his first book as a guide for other bi-vocational ministers like himself. Keith and his wife Jan have been married since 2002 and the couple have two boys. Jan is a 4th grade teacher and she has been a life-long member of City View. He is affectionately known as Rev. Bro. Coach.